Opening a bank account is one of the first things you should do after forming a business. In this guide we’ll discuss the benefits of having a business bank account and why it is essential in keeping your finances safe. Writing checks under your name instead of a business name does not lend your business much legitimacy. If you want customers to write checks to your business's name you will need a business bank account. Having a bank account for business purposes alone allows your business to have its own identity separate from its owners. Having this level of credibility will also help the IRS distinguish your business from a hobby come tax time. Keeping personal and professional finances separate protects you from piercing the corporate veil. If someone sues your business, the courts can seize your personal assets if there is no clear distinction between the owner and the business. Using a business credit card and a business bank account can keep your assets separate and save you from any extra risk. Making large business purchases also puts you at risk for fraudulent activity. If you use your personal bank account to make these transactions, you put yourself at risk for identity theft. Having a business bank account keeps this threat away from your personal assets. We recommend obtaining an EIN (Employer Identification Number) for your business, even if you are a sole proprietorship. This will keep you from having to disclose your Social Security Number. Simplified Accounting: By creating different accounts for your personal and business expenses, you can keep better track of your work finances. You can track spending habits, deposit records, and plan better for business budgeting. Tax Benefits: Only business expenses are tax-deductible. If you continue your business through your personal bank account, the IRS may view your business as a hobby. One of the distinctions used by the IRS includes maintaining “complete and accurate books and records.” Having a separate business bank account will help cement this distinction for tax purposes. Access to Banking and Finance Professionals: Having a business account with a bank will help you to develop a relationship with them. Should you ever have questions, you have different banking professionals that you can discuss matters with. You can open accounts for different business purposes (e.g. payroll, sales) and sometimes even open a business credit card with your bank. When should you make the transition from a personal account to a business account? If you have a new business, your business transactions may be minor at first, but soon they will begin to outweigh your personal transactions. Simply put, you should use a business bank account for all your business expenses. Having all your business transactions in one place makes things easier to manage, as well. It may seem like a good idea to open a business bank account with the bank you use for your personal account. Before you make this decision, though, you should take a few factors into consideration. First, determine whether you want to do banking through a big bank or a community bank. Community banks tend to have higher customer satisfaction ratings because of their smaller size. Building a relationship will also be easier with a community bank. But should you decide to expand your business out-of-state you won't be able to do much outside of your region. Likewise, big banks are less personal but have a national reach. Yet, a big bank won't always have branches or ATMs in your area, so it's worth researching what is near your business. Another option to explore is an online business bank account. These banks are great for those who need service at any hour of the day in any location. Because they don't have branches, online banks tend to have lower fees and higher interest rates than traditional banks. That being said, online banks do not have in-person access nor do they have a wide range of checking options available. Making cash deposits takes a longer time with online banks as well, so if your business does a lot of transactions with cash this may not be the best option. Ready to take the next step? 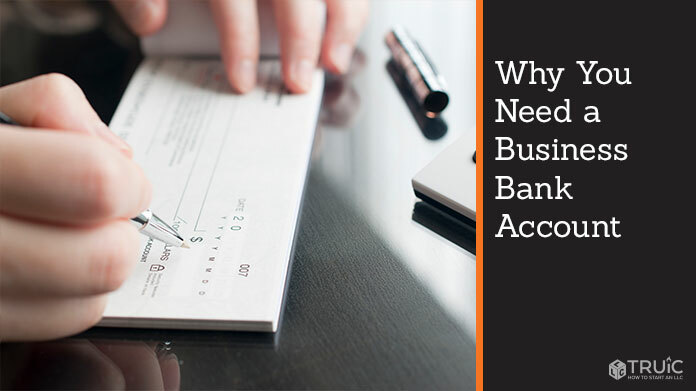 Check out our guide on how to open a business checking account.